There is considerable room for exploration in defining what the new possibility space of personalized, self-defined, emergent economic systems might comprise. Opening up economic systems could have different stages and phases. The first position could be having the same structure of current economic systems, but opening up the parties, interaction types, and business models. The idea of ‘decentralized reddit’ is an example of one such first position. It is still the same Internet pipes, providing the same news items to consumers. What could be different is the hosting, pricing, and business model. The web property reddit could be hosted in a decentralized manner, p2p-hosted by community peers, as opposed to being centrally-served by the company, reddit, Inc. Once the content is hosted by peers, the business model too can change. Instead of indirect advertising-supported centralized models coordinating the serving of eyeballs to vendors, direct pay-for-consumption or freely-contributed content models could go more naturally with a p2p-based content community. This means perhaps leaner economic models with greater price rationalization and value assessment of consumption by users. However, what is possible is not just different economic systems from a business model perspective, but something more fundamentally radical, a blueprint for a new economy. All of the first position, ‘decentralized reddit,’ no matter how decentralized, is still in the same structure, in the traditional structure of how economics has been conceived – of some parties producing goods of value consumed by others for some price (including for free in gift-economies). Extending this, the fully-fledged second position challenges and redesigns what is meant by economic systems, and claims that the purpose and value of economic systems is much broader. Markets have been the only application of economic systems, but the concept is more extensive. Economics is a coordination system, of resources, but more broadly, of reality. Economics is a mediating and coordination system of our interactions with reality. Elements of economic theory might still make sense, like inputs, outputs, and resources, within this broader conceptualization of mediating reality. Resources could be more expansively defined, such as 'what resources are needed as inputs to brains being able to have ideas' as opposed to 'number of units of lumber sold.' Economics, instead of being defined as the production and consumption of scarce goods and services, could be reconceived more generally as a facilitation response to reality, concretized as a discovery and interaction process where something is discovered and valorized by a party, possibly in acknowledgement, interaction, and exchange with another party. Reconceiving economics as the more generalized form of (ontologically) what it is, a coordination system, allows its purpose to be substantially opened. The primary focus of what economics is about can shift. The locus of focus can change from how scarce goods are produced and distributed to instead, something much more generalized, to what our experience of reality is, and therefore to what kinds of responses to reality we would like to facilitate and enable. The notion of reality mediation design is so greenfield that the first question is 'what is important?' Economics can become a greenfield design frame about what might be possible in general in the world. There are arguably two levels of ‘what is important’ – sustenance and actualization. First, certainly one dimension that is important is a post-scarcity situation for the material inputs required for healthy, flourishing human lives. The blockchain automation economy is making great strides towards this. Second, once basic needs are met, the focus can become one of immanence: open-ended expansion up from baseline survival to actualization in terms of growth, learning, creativity, collaboration, and contribution. 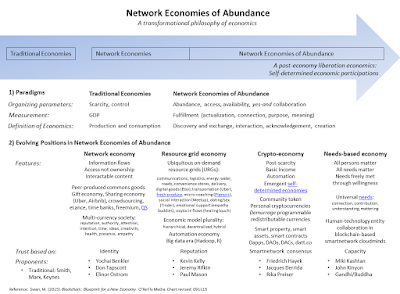 True abundance is having these two levels; not just having survival-level needs met but also and more importantly, entering more fully into an existence of immanence, of open-ended upside potentiality - the actualization economy - and spending more cognitive time in this space. Abundance Theory Studies recognizes both of these dimensions: the immanent potentiality upside of existence, together with the baseline-attaining post-scarcity situation for material goods. True Abundance Economies focus on expanding the position of yes-and improvisation energy directed to self-expression, creativity, and novelty; expanding reality in ways that matter. The Planetary Science Institute has announced plans for the Atsa Suborbital Observatory. Suborbital observatories are a new category of infrastructure that fits into the overall landscape of astronomical observational infrastructure between sounding rockets (expensive with only a momentary window for observation) and higher-altitude space-based observatories (Hubble, Chandra, Spitzer, Webb). Atsa is airborne-based, in this sense similar to SOFIA, though Atsa is able to access 3-5 minutes of zero-g, and is more modular, flying infrared, ultraviolet, and visible range observational equipment. For perhaps as low as $125,000, you might be able to specify your own commercial observing flight, possibly crowdfunded through Fiat Physica (‘kickstarter for physics’); in a sort of community supercomputing for astronomy. The idea of on-demand modular observatories suggests the notion of "distributed autonomous space in space" more generally. Distributed autonomous space (self-delivering pod spaces, like mobile Airbnb for lodging, co-working, etc.) could be terrestrial, and also aerial. There is the idea of airsteading, the vertical analog to seasteading, maybe with self-flying dockable airpods; a potential feature of the future along with the road-steading one might do with self-driving vehicles. Short of funding one’s own concierge observations on Atsa, personalized drones might be employed for DIYastronomy (including via QS mind-controlled rigs). Personalized drone observatories might significantly expand the reach of both professional and amateur astronomers. There is also the possibility of adding astronomical observational nodes to space elevator stations. 3-5 minutes of zero-g time, even if expanded to 9-15 minutes by coordinated Atsa flights from Florida, Texas, and California; essentially a very-large array telescope in space, is still just a few minutes. Instead, modular, ubiquitous space elevator infrastructure might provide continual observational functionality, and other self-financing uses like solar power generation. The emerging mindset of decentralization could include participating in networks by providing infrastructure. Citizen-supported infrastructure could supplement and eventually supplant government institution-provided infrastructure. Resilient community infrastructure and the idea of supplying peer node hosting for network resources was a hope of WiFi mesh networks. The concept of community-provided infrastructure did deploy in peer-to-peer file-sharing with Napster and BitTorrent, and community supercomputing projects like SETI@home and Protein Folding@home, and is now being considered for more kinds of infrastructure. Peer-hosted networks might be more resilient both technically and sociopolitically. Decentralized networks are more technologically sustainable and extensible. There is also a sense of self-empowerment and economic self-determination in peer-provided infrastructure, particularly as an important counterweight to corporate power in the developing blockchain industry. Some examples of community-supported infrastructure could include self-hosted Bitcoin blockchain full transaction-history nodes (Bitcoind), datt.co (decentralized reddit), and personalized drone observation cams. DIYastronomy drones could give the world a mesh network architecture for asteroid watch and the monitoring of other space debris, and also the capture of terrestrial-based events and phenomena. Thus, the sensibility of the digital cryptocitizen could include participating in peer-supported network infrastructure for any variety of affinities; whether DIYastronomy drones for asteroid watch, blockchain ledger hosting, content hosting, decentralized Uber-Airbnb space providing, sustainable foodagtech microgreens hydroponic units, or other activities. Blockchain thinkers or DAC Brains are the notion of having DAO/DAC entities running with smart contracts on blockchains for the purpose of conducting thinking operations. The genesis of blockchain thinkers could be organic or inorganic: human mindfile lifelogs and uploads, and any variety of brain emulations and AI ML/DL algorithms (artificial intelligence machine-learning deep-learning algorithms). One idea is to instantiate your mindfile on the blockchain as a lifelogging tracker and standalone ideation tool: your own mind as an AI DAC. Some key enablers are coming together to make personal AI DACs possible. Idea chains (lifelogging your ideas onto a blockchain) could auto-record your ideas through 1) QS (quantified self)-attached gamma wave spike tracking (recording when you are having an idea), together with 2) cortical image recognition and thought identification (what the idea is about), logged into in a 3) personalized blockchain-based VR consensus reality (coordinating ideas into your own ongoing reality view). Immersive VR (virtual reality), like with the Oculus Rift, is not just video games, virtual worlds, or 3-D CAVE environments, it is digitized experience. Qualitatively different, immersive virtual reality is a means of making physical world experiences real in an alternative medium. VR metaverses then, are parallel realities, as distinct from multiple digital worlds. If you and I go into WoW (World of Warcraft) or SL (Second Life) separately, we see the same world. Even if different levels of views are enabled or locked (like Karl Schroeder’s tech locks in Lady of Mazes ), they are just different lenses on the same world. However, if you and I construct our own digital worlds, we see and create different worlds, possibly on the same basic platform, but the realities can be fundamentally different, with different participants, events, and historical records. Consider the physical world - there is one platform, and we each have varying reality maps or views of the physical reality platform in our heads. There is one consensus reality and historical event record, and conflicts arise out of different views of the consensus reality trying to hew to one (e.g. ; “What happened? X punched Y first. No, Y shoved X first.” – we seek a unique consensus reality of events (Probability Moon further explores the notion of societal shared reality)). Centralized virtual worlds have been the same; there is one reality platform, and centralized event engines record the consensus in one shared events ledger, the game history, even in OpenGL self-hosted models. Now, however, with decentralized models powered by blockchains and dapps, DAOs, and DACs, reality multiplicity is possible. There can be simultaneously existing parallel realities. The multiverse exists, and one place it can be created is in cyberspace. Just as blockchains are the critical enabling technology for digital cryptocurrencies, so too are they a key facilitator of VR multiverses. Blockchains could serve as the backbone infrastructure for multiple parallel realities (VR multiverses) by coordinating the chain of event histories in these multiple realities. The transaction history is not just for transactions, but more broadly comprises the historical event record. Blockchains consensus-generate the historical record, and allow any number of separate and parallel historical records to be created simultaneously. Blockchains are the mechanism for creating and coordinating simultaneous multiple realities. The altcoin space is already an example of simultaneous separate realities. The Selectability of all Reality Features Blockchains consensus-generate the historical record, and further, make it clear that all parameters of reality can be malleable and selectable: time, participation, reputation, memory, history (historicity), economic models (hierarchical or peer-based), and political operations (governance and decision-making). These are all selectable parameters of a reality environment. One recent revolution in economic liberation sensibility is that blockchains allow individuals and communities to self-determine economic systems. Now seen in the VR multiverse context, blockchains are revealed to be much more: they could enable all parameters of a reality environment to be selected. One example of reality feature selectability is blocktime. The timeclock in blockchains is blocktime, the time it takes for blocks of transactions to confirm. The easiest way to specify future time moments (t+n) is via the internal time system of the blockchain, blocktime. For example, the term of a certain decentralized dapp loan might be 7000 block confirmations. Blocktime is the clocktime of blockchains. Certainly blocktime converts to physical world time, but differentials could arise and give way to arbitrage opportunities or other divergence-as-a-feature possibilities. The key point is that all reality parameters, including time and space, could become malleable in blockchains and especially in blockchain-coordinated VR metaverses. Further, if blockchains become the mechanism for keeping time and event histories, de facto they become memory, where memory is a critical functionality that feeds back directly into lifelogging and Brain-as-a-DAC idea chains. The earlier positions in human liberation have been the right to self-determination in certain contexts, in different parts of life and the experience of reality. These include the right to self-determination in governance, legal systems, IP protection/sharing regimes, software business models, neural data privacy rights, cognitive enhancement, and most recently, the emerging sensibility of the right to self-determine one’s own economic systems. These are all important steps in the liberty of the individual, but they are all in some sense intermediary positions on the way to the now-visible bigger position which is the right to self-determine one’s own overall reality, and really, realities (plural). A new sensibility could be seeing the right of each individual, entity (human and machine/technology entities), or group to self-define its own personal consensus reality (realities). The central component of the self-determination of organisms could be the operation of its own consensus reality(ies). Blockchains are a means for consensus-generating the historical record (a historicity mechanism) to facilitate reality multiplicity, and they are the means of enabling value flow. In network economic theory, this is beyond the transactional sense of the value flow of currency from me to you, where unleashing the creation and transmission of many kinds of non-monetary value flows is the bigger picture of what is at stake and possible in creating multiple realities. Non-monetary currencies (like universal human needs for connection, contribution, mattering, and understanding) can be registered and tracked as blockchain-based smart assets. One reason for VR realities, what we are really wanting in creating new realities (via VR multiverses) is creating spaces that are free of the limiting constraints of physical realities. These constraints pertain to both the physical world and human limitations, including matter, gravity, time, illness, disability, impairment, sleep, recovery, distraction, cognitive bias, etc.) such that more freedom, exploration, collaboration, expression, creativity, fun, serendipity, progress, and contribution can be enabled. We want to cognitively enhance proximately for a better memory, sure, but ultimately to be 'bigger' in the sense of being more able to grow and participate beyond our initial position of self. We want more of the creative yes-and collaboration space of new energy and idea generation. The ‘economy’ of the future might be measured based on non-monetary value flows like ideation, which could be orchestrated by public and private reality blockchains. Now possibly having a situation of multiple simultaneous realities, what is there to do with them? There are several implications for the future of privacy, sharing, and collaboration. For example, there is a question about when and how to cohere and merge VR DAC brain realities. Therefore, within realities, there might be sub-threads or other means of parsing and segmenting sub-realities. Mindchains could be a means for how to safely mindshare or collaborate in a cloudmind, for example by permissioning your subreddit ledger for ideation related to certain areas as opposed to your full mindfile or meat-brain….“here, let me share everything with you I’ve thought about crowdsourced genomic studies,” or "here, join the mindslack channel for this community." Blockchain apps could auto-merge shared realities in the way that topical queries are ambiently processed in the background now. There could be situations analogous to Hayek’s competitive currencies where reality views compete. There could be reality ecologies where repetitive threads across individual realities converge into shared group realities (the unobtrusively representative politics of the future). Right now this happens manually with the blunt tools of the physical world; we search for other individuals, groups, and institutions with our own shared values and reality view, and blockchain DACs might facilitate the automatic canvassing and convergence of all of this. We might know that VR metaverses and the human-machine collaboration are really working when VR NPC DACs self-create in our realities per sensing our human needs (actualization, contribution, growth and learning, exploration, creation). Blockchain-based VR AI DACs could auto-sense and create whatever 'Tuscany houses' are needed to grow an entity (like a human or machine mind) in its progression. For example, in an ideas 'economy,' the most important inputs are anything which facilitates the development of ideas, and attending to this could be one purpose of a an NPC VR AI DAC in your personal VR metaverse, operating via smart contracts on your mindchain. Ideas are the demurrage-redistributable basic income of a blockchain thinker Brain DAC. 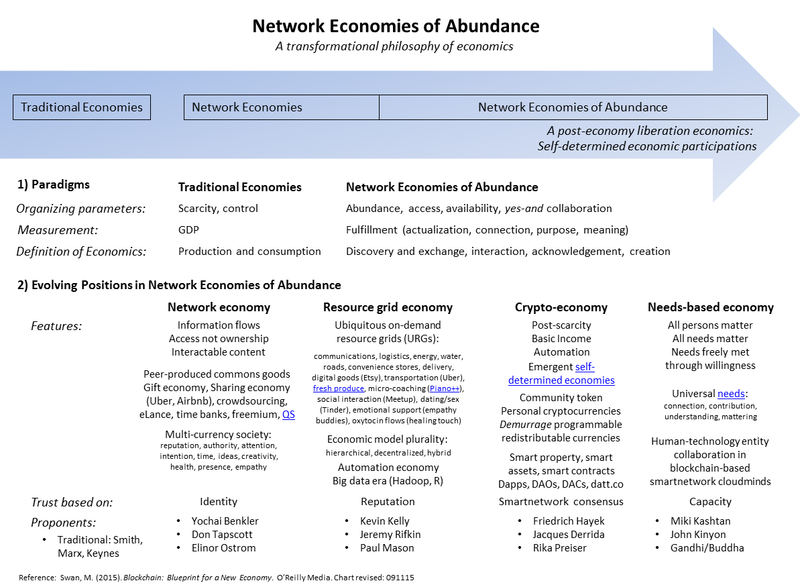 Blockchain thinker Brain DACs then become another Ubiquitous Grid Resource, an important one, for idea generation, in the overall picture of the future Network Economies of Abundance. Acknowledgement: This post was inspired by ideas from Maciej Olpinski regarding consensus in virtual reality worlds. POV HUDs are a mechanism to accommodate multiple levels of technology adoption within a society; e.g. ; through my HUD, I see unimproved nature and birds tweeting; through your HUD, you see propositional nanotech 3-D printed finery self-mutating in utility fogs.